The Nigeria Customs Service Federal Operations Unit Zone ‘A’ Ikeja, Lagos, has recovered over N1.4 billion (One billion, four hundred and five million, seventy-nine thousand, eight-six naira only) from its latest anti-smuggling operations. Head of the Unit, Comptroller Muhammed Uba, told newsmen that the Unit had been beamed its searchlight into the creeks and bush parts battling the smugglers, and that it would continue to be committed to its duty of tackling the menace of smuggling, which he described as injurious to the nation’s economy. Uba said that from May 16 to June 12, operatives of the Unit were able to recover a total of fifty-nine million, five hundred and six thousand, seven hundred and seventy three Naira, twenty five kobo (N59,506,773.25) from underpayments. According to the Comptroller, the seized items including various contraband goods, and vehicles on detention have a duty paid value of One Billion, Three Hundred and Forty Five Million, Five Hundred and Seventy Two Thousand, Three Hundred and Thirteen Naira, (N1,345,572,313), thus making a total of One Billion, Four Hundred and Five Million, Seventy Nine Thousand, Eighty Six Naira only (N1,405,079,086) within the weeks under review. Accordingly, the seized/detained goods at the Unit are 15 Exotic vehicles including 3 Toyota C-HR (2018 models), 1 Toyota Camry LE (2018), 1 Toyota Prado (2018), 1 Toyota Hilux (2017), 1 Ford F150 (2017), 1 Pajero Jeep (2017), 1 Mercedes Benz (2017) among others. 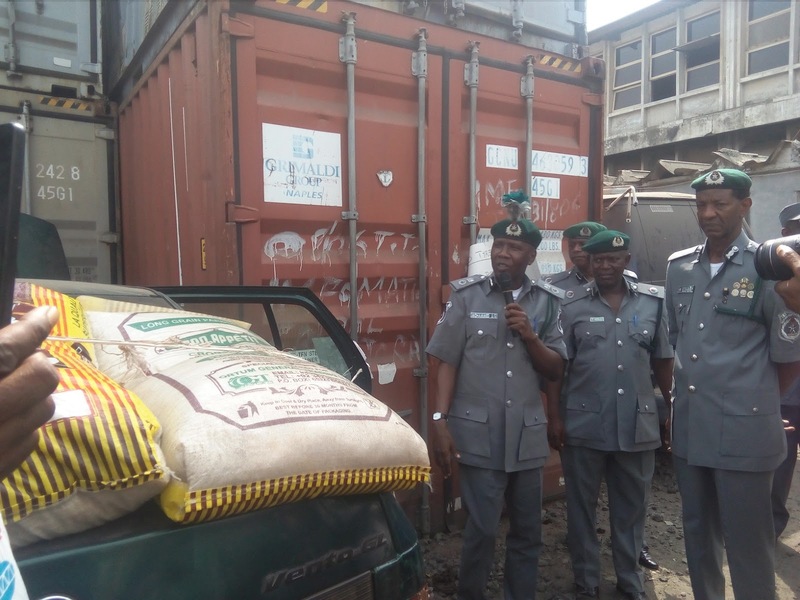 The other seized goods are 9,049 bags of foreign parboiled rice (15 trailers), 1,464 cartons of frozen poultry products, 870 jerrycans of vegetable oil, 273 bales of used clothing, 592 pieces of used tyres, among others. Also, four containers with no: PCIU850134/9, PCIU8278544, FCIU983753 and TGHU6924330 have been seized for false declaration. While two of the containers were carrying 8,633 pieces of empty cylinders as against plumbing materials declared in their SGD, the other two carried 120 bales of new jeans as against punching machine declared in the SGD.